The results of the photo-competition at Tiger Canyons, judged by Daryl & Sharna Balfour are out. Daryl had this to say: "It is a fact of digital photography that all digital images require a certain amount of post processing whether we like it or not". Daryl & Sharna selected the top five and then selected 13 highly commended pictures. First prize goes to Yvette van Bommel for this shot of Sunderban and Shine romping in the pool in the canyon. For me it brought back memories of one of the greatest years of my life as we walked with Sunderban, Shine and Zaria (the abandoned cubs) every day down the canyon. 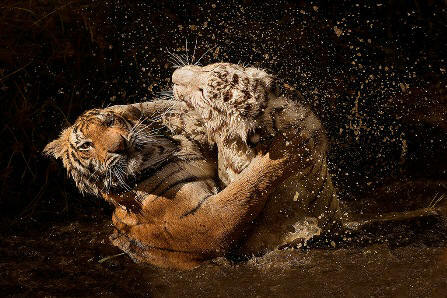 For the first time I realized what a big part water plays in the life of a tiger. They play, stalk, hunt and hide kills in the water, the ultimate water cats. 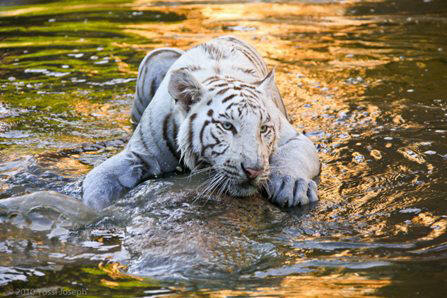 Yvette's picture has captured the power, the beauty and the fun of these magnificent creatures playing in their element. Congratulations Yvette, you have won the Big Cat Safari for two. Second prize goes to Yossi Joseph with this shot of Shine lying in the water. It immediately brought back memories of this magnificent tigress who was tragically taken from us. Congratulations Yossi, you have won a Tiger Safari for two. Third prize goes to Rheiner Keller with this shot of Julie charging through the water. Julie, Tiger Bomb (Tibo), Mahindra and Indira were all in the water hole looking for the remains of a warthog. The cubs watched as Julie used her feet to feel for the carcass. Then the cubs imitated her, feeling in the mud for the warthog. Suddenly, tired of the game, Julie turned straight towards the jeep and charged playfully out of the water. 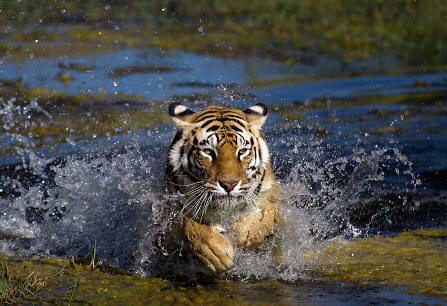 Rheiner's picture captures the power and beauty of the tigress at full charge through the water. Congratulations Rheiner, you have won one night for 2 people at Tiger Canyons. Peter Finlayson's "Triangle of Love" brought back memories of when James Boon, cameraman, Daryl Balfour photographer and I, followed Julie during the last 4 days of her pregnancy. We were desperately hoping to photograph and film the birth of the cubs. On the afternoon of the 107th day of the pregnancy, a huge electrical storm descended over Tiger Canyons, forcing us to abandon the attempt. Early the next morning, we found Julie suckling four normal and one white cub. It was a magical moment, to say the least. Four of the cubs have survived and have turned into magnificent tigers. 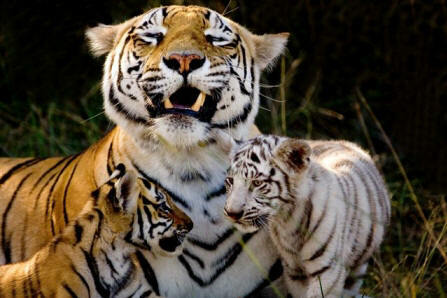 Julie has proved to be an exceptional mother and brought us much new knowledge of the denning methods of tigresses. 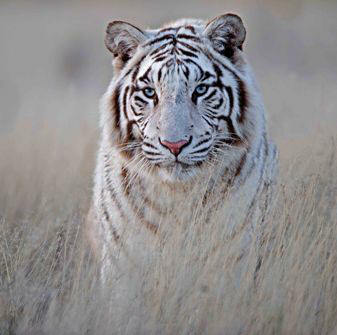 Bridgena Barnard's picture of Tiger Bomb (Tibo) captures the haunting blue eyes of this magnificent creature. I see her everyday and everyday her beauty takes my breath away. Tigress Tibo is at present dispersing and we will shortly start a research project and a film on what are the disadvantages of a white tigress while hunting. We can now make a comparison between the hunting success of a normal tiger versus a white tiger. Later this year, we will have another competition. You will be asked to submit one picture of a tiger, a lion, a leopard and a cheetah. Each picture will score points and the points will be added. Whoever has the most points is the winner. More details later. To all who entered the competition thank you! To the judges thank you and to the winners congratulations. All pictures are on the Tiger Canyons website. It makes me extremely proud that what was once a sheep farm, is now a home to free ranging tigers. Against this magnificent backdrop, your photographic talent has produced these world class images which will travel across the world. Congratulations! Until the next time, tread lightly on the earth. A couple needed to help JV with the tiger project. Preferably steeped in the Londolozi culture. Between them guiding, FGASA certificate, photographic, filming, catering and IT skills necessary.